With vibrant colors entering the men's wardrobe collection, it is not a surprise to find amazingly stylish and bright colored options in men's footwear collection as well. 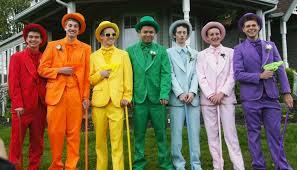 Just as the formal colors for men's suits were limited to black, brown, nay or grey. Men's footwear's were popular in dark color shades that actually matched with any colored outfit that they wore. But when style and trends enhanced in men's wardrobe collection, there are newer colors and designs available in men's shoes collection as well. 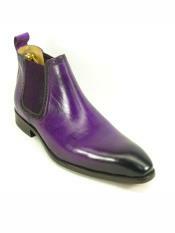 Talking about different colors, purple shoes are one among the different colors in men's footwear. 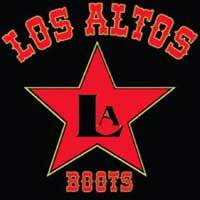 By the very name, it might sound quite different as no one generally is seen wearing purple colored shoes. But these days the colors of men's apparels and outfits vary so much and come in different and unique options, that such colors in men's footwear collection are most welcomed. 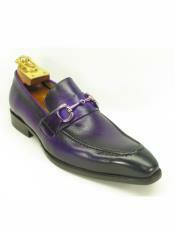 Purple shoes for men come in different shades that resemble colors like violet, dark purple, light purple and so on. These shoes are designed in stylish patterns with dual toned patterns, oxfords styles, lace up pattern, slip-on or loafers style etc. Men's dress shoes are usually related to the typical formal dress shoes for men that come in black, dark brown shades that men prefer to interchange and wear with multiple outfits. 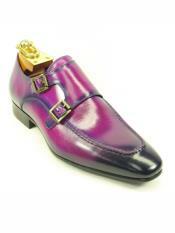 Purple dress shoes are an exception when it comes to the common formal shoes for men. 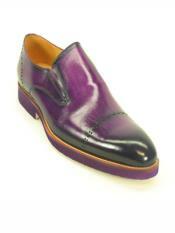 This color looks exclusively stylish when worn with a matching purple suit for men. 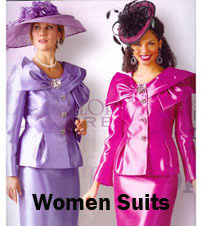 Purple and violet colored men's suits are in trend especially for informal occasions. Auspicious and traditional occasions like weddings are better graced with such unique colors that make you look class apart from the regular. If you are looking for some stylish dress shoes collection, opt for purple dress shoes for occasions like weddings, dinner parties, prom nights and so on. 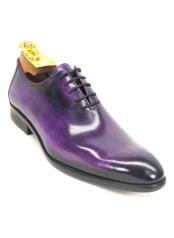 You will never go wrong wearing a purple dress shoe, matched perfectly with a stylish purple suit. Dual toned purple dress shoes come in matching combinations like white and purple dress shoes, purple and black dress shoe and so on. Different styles like loafers, slip-ons, sneakers, oxfords, formal shoes, casual shoes etc are all available in the purple shoes collection for men. 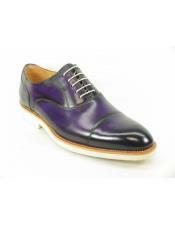 Browse through this category at Mensusa to shop for some amazing collection of purple dress shoes for men online. You will find dress shoes in purple color crafted in unique and stylish designs available in different shades of purple color. 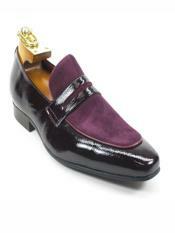 Prices of these classic purple dress shoes for men are cheap and affordable. Products from Mensusa are long lasting and durable. 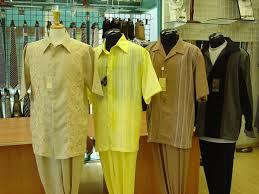 Hence you can shop with confidence from our specialized men's online store. 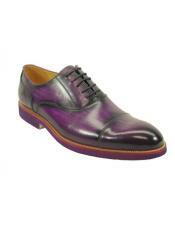 Find all shades of purple in men's dress shoes collection ranging from the darkest to the lightest.